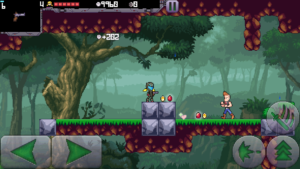 If Someone Asks Me Which One Is “Best Action-Platformer” Game On Android, Then I Would Suggest Cally Caves Series. 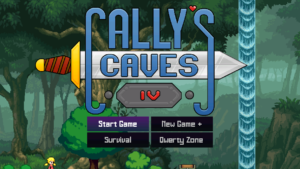 Vod Games Finally Released The 4th Version Of Cally Caves In Google Play Store After iOS Release. It Comes With Three Zones – Regular, Survival, And Qwerty Zone. All Of The Zones Are Fully Addictive And You Love To Play. Herbert, under the influence of the G.S.S. kidnapped her parents and took over the Caves. You Slay Down Enemies With Powerful Weapons – Pistol, Shotgun, Boomerang, Flamethrower, Bow, RPG, Discgun, Sniper Rifle, Blaster, Scrap Cannon, And More. Initially, You Have A Pistol Only. You Need To Find These Weapons By Exploring All Places, Breaking Treasury Boxes. Once You Got Them, You Can Switch To Anyone As Per Your Need. Cally[The Main Role]. You Can Change Costume Of Cally From The Settings. Another 6 Characters Are – Lloyd, A Musician[Guider], Robert, Cally’s Best Friend, Bera, Robin, Her Sister, And More. Herbert Kidnapped Cally’s Parents And Attempted To Take Over Caves. In Cally’s Caves 4, Your Goal Is To Slay Down All Enemies And Reach Final Destination[Cave]. You Use Weapons To Kill Bad Guys. Enemies Are So Powerful With Special Attacking Skills. Health Plays An Important Role In Cally’s Caves. If You Lose All, You Will Start Again. However, You Can Easily Recover Health By Slaying Down Enemies, Unbox Treasury Boxes. You Fight Against Powerful Bosses Having Super Attacking Power. Jaeger, The Engineer, Architect, Melvin, The General, Qwerty, Infinity Golem, And The Doctor Are Bosses. You Start With The Winding Woods And End The Regular Session By Completing Zone 9. After That, You Play Survival And The Caves Mode. This Action-Platformer Is Not Too Easy. Enemies Are Very Powerful, You Need To Protect Yourself To Save Health. Tips – Explore All Paces In Each Level And Break Treasury Boxes. These Boxes Includes Health, Coins, Diamonds, And Other Stuff Which Is Very Useful. Another Reason To Explore All Places Is “Weapons”. Final Words – Cally’s Caves 4 Is A Great Action-Platformer Game With Challenging Levels, Great Story, And You Will Never Be Bored In This Game. Must Play!! Next Post:Drag’n’Jump, Overview – It’s Time To Fly With A Car?